There’s loads of kids activities, snow effects, street performers and also Santa Claus will be there and so much more, so don't miss out! 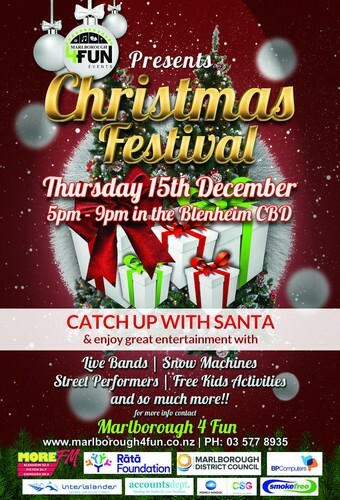 Christmas Festival is a magical event for kids young and old - perfect for getting into the Christmas Spirit. With the help of you own More FM, Rata Foundation, Marlborough District Council, BP Computers, Interislander and Accounts Dept we are happy to bring to you this Awesome event! For more info call 03 577 8935 or check out our Facebook page.